Easter is fast approaching, and of course that means it’s time to plan for Easter dinner. In true just-moved-in fashion, I am miserably behind on preparations; however, I do know that we will have a spiral-sliced honey glazed ham and some of these homemade hot rolls. The rest is yet to be determined. 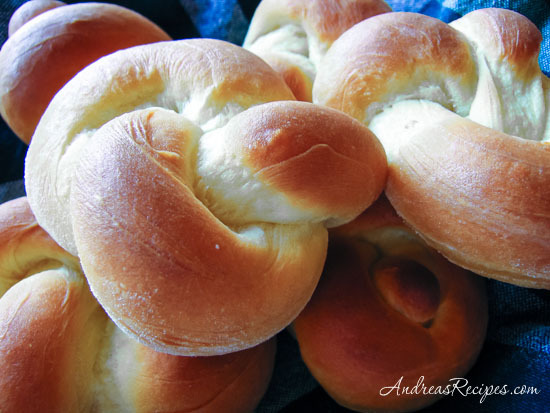 I began making these yeast rolls years ago, and I reserve them for special occasions. 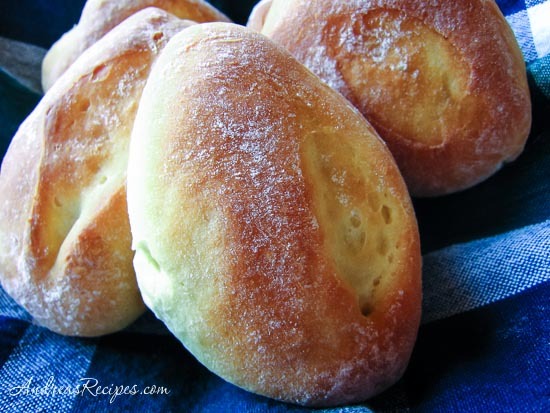 The original recipe comes from my old Farm Journal’s Homemade Breads cookbook, which explains how to use the same recipe and make a dozen different types of hot rolls. It’s the same dough, you just shape them differently or make them brown and serve. So for this post, I have made almost all of the variations on this recipe—hot rolls 11 different ways. The only shape I didn’t make was the clothespin rolls. I’ve never made them because I don’t keep wooden peg clothespins on hand, and I didn’t find any at the local discount stores this time around, either. The boys have really enjoyed all my preparation for this post. I made rolls every day this week and they have looked forward to our baking sessions each day…especially the part where they get to eat the rolls. I caught one of the boys sampling the rolls yesterday evening. I had just put the baby down for the night and I thought I heard one of the boys in the kitchen, and I figured the rolls were being raided. What I found was my two-year-old sampling rolls. He took one or two or three bites out of seven rolls and then put them back on the cooling racks. I guess he thought that since they all looked different they should taste different, too. The recipe is pretty straight forward, with just one long rise and one short rise. The dough is enriched with milk and eggs, which give the rolls a wonderful richness. The recipe calls for shortening, and I use the butter-flavored kind. Normally I’m a strictly butter kind of gal, but the shortening seems to give the dough a really good, easy to work with consistency, so I’ve stuck with that. Also, the original recipe calls for active dry yeast, which I used for years, but now I prefer instant yeast. I have included instructions for active dry yeast in the Variations. This is also my entry for this month’s WTSIM (Waiter, there’s something in my…). Andrew of Spittoon Extra is our venerable host for this event, and the theme is BREAD. I’ll post an update when he posts the round-up at the end of the month. UPDATE: You can find the round up of all the bread entries at Spittoon Extra. Adapted from Farm Journal’s Homemade Breads. Makes 24 to 36 rolls, depending on the shape you choose. 1. 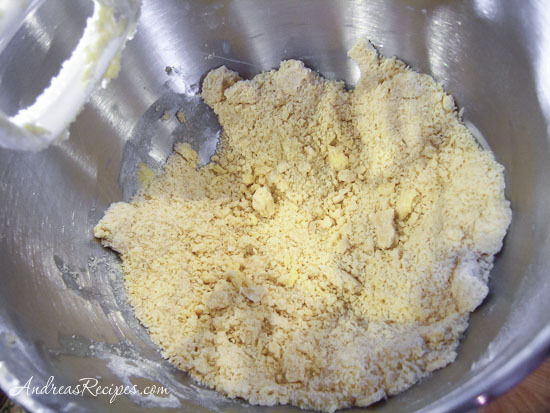 In the stand mixer bowl, stir together the yeast, 1-1/2 cups flour, sugar, and salt. Using the paddle attachment, mix in the shortening until you have fine crumbs. 2. In the small bowl, stir together the water, milk, and eggs. Add the egg mixture to the mixer bowl and mix on low speed until combined. Increase the speed to medium and mix for 2 minutes. Add 1 cup flour and mix 2 more minutes. 3. 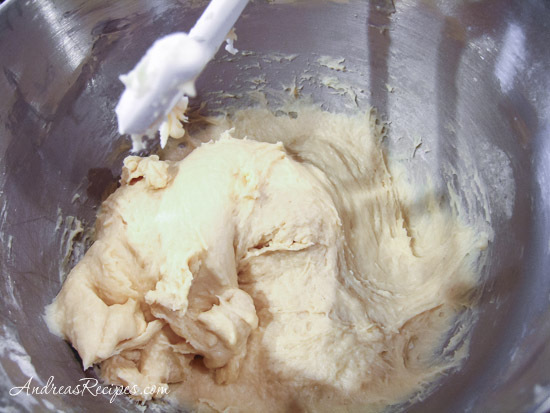 Continue adding flour and mixing on low, just until you have a soft dough. 4. Remove the paddle attachment and insert the dough hook. Knead the dough for up to 5 minutes, until it is smooth and elastic. 5. Put the dough into the prepared rising bowl and turn it over so that both sides of the dough are coated with the cooking spray. Cover with a towel and allow to rise in a warm, draft-free place until doubled, about 1 hour. 6. Punch down the risen dough and turn it out onto a board. Cut the dough in half, then cover and allow to rest for 10 minutes. 7. Preheat the oven to 375° F.
8. Cut or roll the dough according to the directions below for your desired shape. Cover and allow to rise until doubled, about 30 minutes. 9. Bake for 15 to 20 minutes, until golden brown. Remove from baking pans or sheets and serve warm. 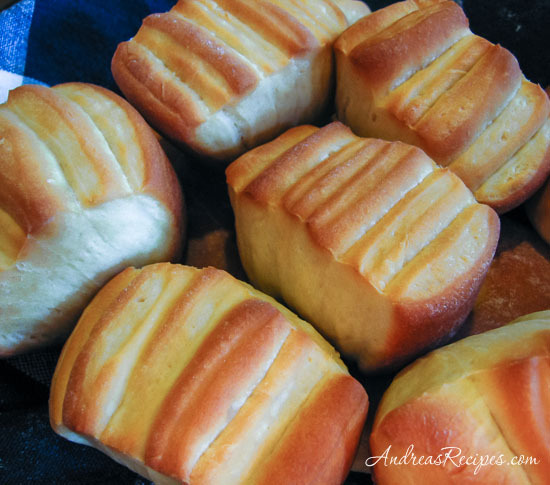 Pan Rolls: Divide each dough half into 12 pieces, and roll each piece into a ball. Place the balls in rows in 2 greased 8x8x2 pans. 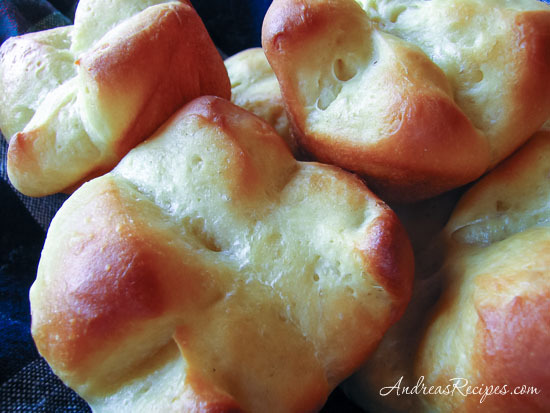 Dinner Rolls: Divide each dough half into 12 pieces, and shape each piece into an oval. Grease a couple baking sheets and place the rolls 2 inches apart. Cover and allow to rise until doubled, about 40 minutes. Mix together 1 egg white and 1 tablespoon water. 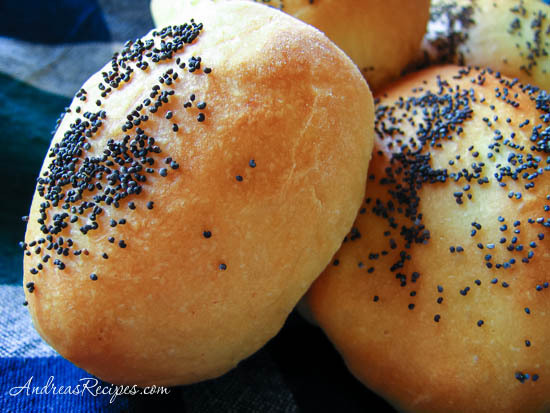 Brush the egg mixture on the rolls, then sprinkle with poppy seeds, caraway seeds, or coarse salt. 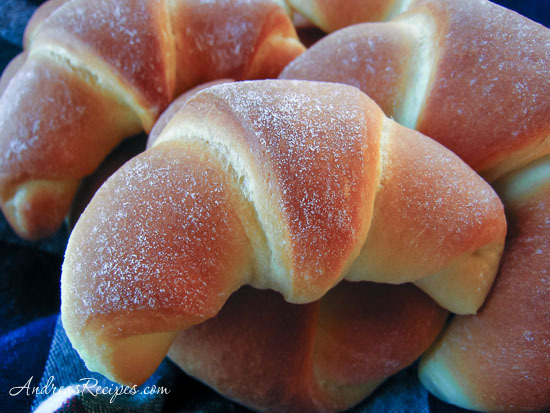 Crusty Rolls: Divide each dough half into 12 pieces, and shape each piece into an oval. Grease a couple baking sheets and place the rolls 2 inches apart. Use a very sharp knife to cut 1 lengthwise slash in each roll about 1/2-inch deep. Dust lightly with flour. 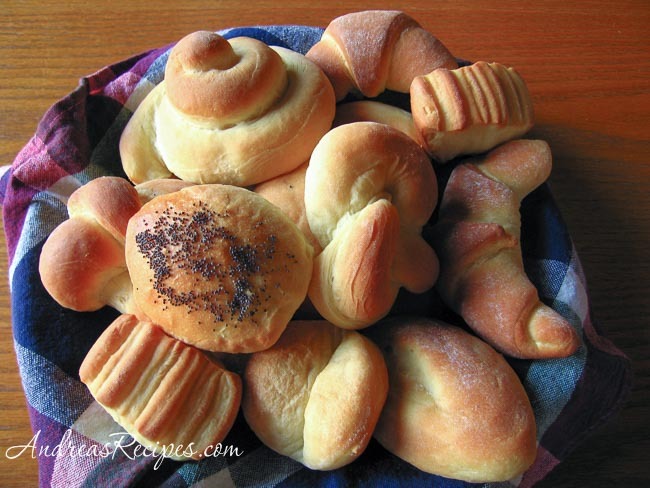 Cloverleaf Rolls: Divide each dough half into 36 pieces, and roll each piece into a ball. Grease 2 regular muffin pans and place 3 balls into each muffin pan cup. 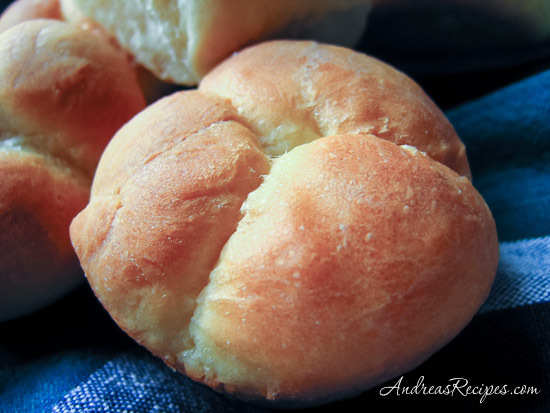 Easy Cloverleaf Rolls: Divide each dough half into 12 pieces, and roll each piece into a ball. Grease 2 regular muffin pans and place 1 ball into each muffin pan cup. Using kitchen shears, cut each ball almost in half and then again in quarters. Cut almost all the way to the bottom of the balls. Knot or Rosette Rolls: Divide each dough half into 12 pieces, and roll each piece into a 12-inch long rope. Gently tie each rope in a knot. To make rosettes, tuck the ends underneath the knot. Grease 2 baking sheets and place the rolls 2-inches apart on the sheets. Snail Rolls: Divide each dough half into 12 pieces, and roll each piece into a 12-inch long rope. Coil each rope into a snail shape. Grease 2 baking sheets and place the rolls 2-inches apart on the sheets. Crescent Rolls: Lightly flour a rolling pin, and roll each dough half out into a 16-inch circle. Spread softened butter all around the circle. Cut each circle into 12 wedges and roll each wedge, starting at the wide end. Grease 2 baking sheets and place the rolled wedges on the sheet, points down. Curve the ends to form crescents. Parker House Rolls (named for the Parker House Hotel in Boston): Lightly flour a rolling pin, and roll each dough half until it’s 1/4-inch thick. Using a floured 2-1/2-inch round cutter, cut 18 circles from each dough half. Brush tops of the circles with melted butter. Fold circles so that the top half overlaps the bottom half. Grease 2 baking sheets and place the rolls in rows 1/2-inch apart. Makes 36 rolls. Fan-Tan Rolls: Lightly flour a rolling pin, and roll one dough half out into a 13×9-inch rectangle. Brush with melted butter. Cut the rectangle lengthwise into 6 strips. Stack the strips evenly, with the buttered side up, and cut the stack into 12 pieces. Repeat with the other dough half. Grease 2 regular muffin pans, and place one piece in each muffin pan cup, with the layers facing up. Clothespin Rolls (not pictured): Divide each dough half into 12 pieces, and roll each piece into a 12-inch long rope. Wrap each rope around a greased wooden peg clothespin or a 4-inch long piece of dowel, 1/2-inch thick. Grease 2 baking sheets and place the rolls 2-inches apart on the sheets. Remove the clothespins immediately after baking the rolls. You can fill the center holes with jelly or jam. Use 2 packages active dry yeast instead of instant yeast. Proof the yeast by mixing it with 1/2 teaspoon sugar and 1/2 cup warm water. Allow to bloom, then add the remaining ingredients. 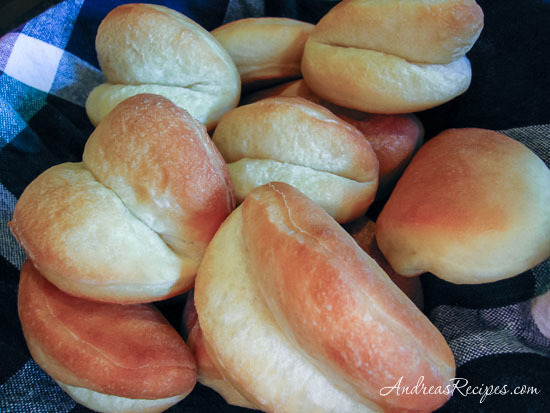 If you want crusty rolls, brush the shapes with melted butter and allow to rise uncovered. For soft rolls, brush the rolls with softened butter immediately after baking. Brown-and-Serve Rolls: Prepare the dough and shape the rolls according to instructions above, any shape of your choice. Let rise until doubled, about 30 minutes. Bake in a 275° F oven for 20 minutes, or until the rolls are set but not browned. Immediately remove the rolls from the pans and cool them on racks. Store the rolls in plastic bags in the frig for 3 days, or freeze for up to 2 months. To serve the rolls, thaw and placed on a greased baking sheet. Bake in a 400° F oven for 10 to 14 minutes, until golden brown. They look so yummy, what a great way to greet family and friends with these dinner rolls, now I am curious about the clothespin shape. Happy Easter! Thanks Cris, and yes I’m still looking for those clothespins. I do want to try that shape sometime, and when I do I’ll add them to the post. 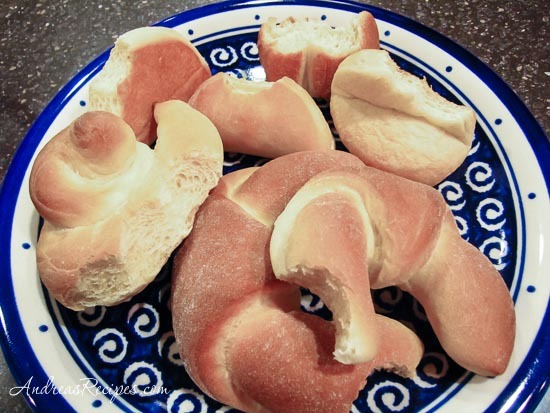 The bread just looks so yummy and preety…. Thank you Suzan! The family really enjoyed them. I did it! 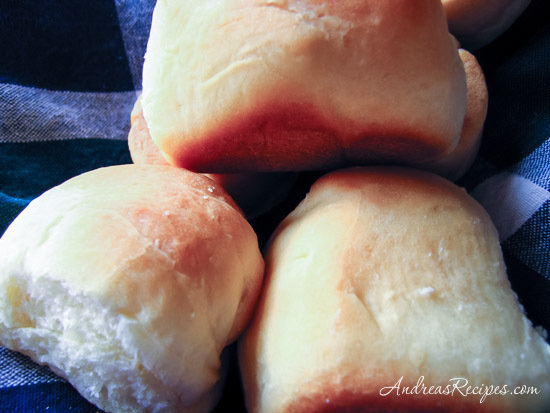 I used your recipe and created my first rolls ever …. my first anything ever using yeast. Thanks for making it look easier and thanks for all of the pictures of the dough consistency! Keely, glad to hear that the recipe worked for you! These look soooo yummy Andrea. Great job!! By the way, I saw the wooden peg clothespins today at a local dollar store. You might check one out. 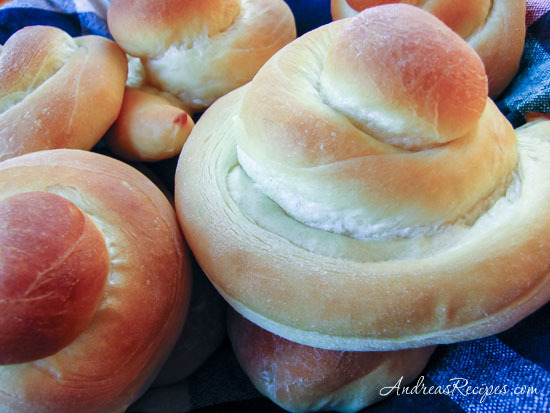 Those cloverleaf rolls remind me the ones my mom always made for Thanksgiving! I love the variety and this is a great resource for how to make different shapes. Thanks so much! They look yummy, Thanks for the idea to make them all different shapes!! I am so excited to start this recipe tomorrow. I just have one question before I start and possibly do something wrong… After I bake the rolls in a 275° F oven for 20 minutes do I need to let them cool do stick them back in the oven in 400° F oven for 10 to 14 minutes as well? Please let me know ASAP. Thank you! Hi Julie! You only need to do those steps if you are making brown and serve rolls (making them one day, and serving them another day). If you plan to make and serve right away, then follow Preparation steps 1 through 9, baking at 375 F for 15 to 20 minutes. Really great page, I love how you show that the basic recipe (and, it’s a particularly good one) can be used for the various shapes. All the best from a long long time bread baker.